This article is about the company. For the founder, see Victor Hasselblad. For the foundation, see Hasselblad Foundation. For Hasselblad Masters, see Hasselblad Masters Award. For the award, see Hasselblad Award. "Imacon" redirects here. For the similar-sounding term, see Imagon (disambiguation). DJI, Ventizz Capital Fund IV L.P.
Victor Hasselblad AB is a Swedish manufacturer of medium-format cameras, photographic equipment and image scanners based in Gothenburg, Sweden. The company is best known for the classic medium-format cameras it has produced since World War II. Perhaps the most famous use of the Hasselblad camera was during the Apollo program missions when humans first landed on the Moon. Almost all of the still photographs taken during these missions used modified Hasselblad cameras. Hasselblad only produces about 10,000 cameras a year out of a small three story building. The company was established in 1841 in Gothenburg, Sweden, by Fritz Wiktor Hasselblad, as a trading company, F. W. Hasselblad and Co. The founder's son, Arvid Viktor Hasselblad, was interested in photography and started the photographic division of the company. Hasselblad's corporate website quotes him as saying, "I certainly don’t think that we will earn much money on this, but at least it will allow us to take pictures for free." Victor spent the next several years studying and working in various photography related endeavors in Europe and the US, including Rochester, New York, with George Eastman, before returning to work at the family business. Due to disputes within the family, particularly with his father, Victor left the business and in 1937 started his own photo store and lab in Gothenburg, Victor Foto. During World War II, the Swedish military captured a fully functioning German aerial surveillance camera from a downed German plane. This was probably a Handkammer HK 12.5 cm/7x9, which bore the codename GXN and the military account number Fl.38510. Victor Hasselblad's real ambition was to make high-quality civilian cameras. In 1945–1946, the first design drawings and wooden models were made for a camera to be called the Rossex. An internal design competition was held for elements of the camera; one of the winners was Sixten Sason, the designer of the original Saab bodywork. In 1948, the camera later known as the 1600 F was released. The new design was complex, and many small improvements were needed to create a reliable product; the watchmaking background of many of the designers produced a design which was sophisticated, but more delicate than what was required for a camera. Only around 50 units were produced in 1949, and perhaps 220 in 1950, of what collectors have now designated the Series One camera. The Series Two versions of the 1600 F, perhaps as many as 3300 made from 1950 to 1953, were more reliable but still subject to frequent repairs, with many units having been cannibalized or modified by the factory. The biggest problem was its shutter, a focal-plane shutter that was hard to keep accurate. Using 120 size film it was formatted to a square 6 cm x 6 cm or 2 & ¼ by 2 & ¼ inches which meant there was no more need to turn the camera on its side. In 1954, they mated the groundbreaking new 38mm Biogon lens designed by Dr. Bertele of Zeiss to a shallow non-reflex body to produce the SWA (Supreme Wide Angle, later changed to Super Wide Angle). Though a specialty product not intended to sell in large numbers, the SWA was an impressive achievement, and derivatives were sold for decades. Hasselblad took their two products to the 1954 photokina trade show in Germany, and word began to spread. In 1953, a much-improved camera, the 1000 F was released. It too had a focal-plane shutter which led to its final replacement by the 500 C but nonetheless provided a big leg up in the medium format. It had a very fine 200mm f4 Sonnar sport lens that made it a great wildlife camera. Lenses ranged from a 60mm Distagon, standard 80mm Planar, and on up to the 200 mm. In December 1954, the 1000 F camera received a rave review from the influential American photography magazine, Modern Photography. They put over 500 rolls of film through their test unit, and intentionally dropped it twice, and it continued to function. But the 1000 F also had shutter problems and finally gave way to the lens-mounted, tried-and-true Compur shutter, retaining its focal-plane shutter/curtain only to mask the film until the Compur shutter closed, then opened to expose the film. This was a far more dependable system, even though it meant having a shutter in each lens. In January 2003, the Shriro Group acquired a majority shareholding in Hasselblad. The group had been the distributors for Hasselblad in Japan, Hong Kong, China, Taiwan ROC, Singapore, and Malaysia for over 45 years. Hasselblad's first civilian camera was launched in 1948. Born from the idea of Victor Hasselblad to create the "ideal camera", it was a 6×6 cm format focal-plane shutter SLR camera that was six inches long. First simply known as the "Hasselblad Camera" it was later named "1600 F" after its highest shutter speed of 1/1600 sec and "F" for "focal plane". The camera was revolutionary for the time with its modular design that allowed exchanging lenses, viewfinders and film magazines. The shutter was made of thin stainless steel which was light and durable enough to withstand the high acceleration forces of this fast shutter. Hasselblad 1000 F and especially 1600 F cameras are very rare on the secondhand market and usually not in working condition because of age, neglect, and a lack of spare parts and qualified repairmen. Many cameras suffer from corrosion of the chrome rims. A lot of lenses suffer from scratches, fungus, discoloration and separation. Cameras in good condition can therefore fetch fairly high prices. The designation 'V-system' was not used until the launch of the H-system. The name "V System" was not created until the development of the "H System"; with a new system premiering, Hasselblad needed a designation to differentiate the older product line. The Hasselblad V-System evolved out of Victor Hasselblad's desire to develop a small camera with fast lenses and shutters, that was as easily hand-holdable as a Leica, but with a larger film format. The Rolleiflex's 6×6 format was deemed ideal: large enough to provide high image quality, but small enough to fit inside a compact camera. The Rolleiflex's leaf shutter lacked the fast shutter speeds focal plane shutters could provide, and neither Leica rangefinder nor Rolleiflex TLR provided the(TTL) through the (taking) lens viewing that the slow to use, big Graflex SLR provided. These considerations led to the 1600 F and a flexible camera system that includes interchangeable bodies, lenses, viewfinders, winders, film magazines and holders, and other accessories. Problems with the focal plane shutters in the 1600 F and 1000 F cameras and especially the increasing importance of electronic flash led to the development of the manual leaf shutter-based medium-format 6×6 (6×6 cm or 2¼×2¼ inches) 500 C SLR camera in 1957 which offered flash synchronization at all shutter speeds. The 500 C was joined by the motor-driven 500 EL SLR camera in 1964. Apart from the housing that incorporates the motor drive and the NiCd batteries, this camera is similar in appearance and operation to the Hasselblad 500 C and uses the same magazines, lenses and viewfinders. These two cameras, together with the Superwide Camera (SWC) which was introduced in 1954 as a wide angle camera using the Carl Zeiss Biogon 38 mm f/4.5 lens and built-in levels for exacting architecture photography, formed the core of the V-system and shared most accessories (with a few exceptions). 500EL and its successors have been and still are used mainly as workhorses in photo studios. This camera type became also very famous when a heavily modified version of it was used in the U.S. Apollo lunar exploration program. In 1968 it was used by astronaut William Anders to take the image known as Earthrise. As an outgrowth of the experience with NASA cameras, a photogrammetric version of the Hasselblad 500 EL/M, the Hasselblad MK 70, was constructed with specially calibrated components. The H2F can be used either as a film camera or as a digital camera when mated with a Hasselblad CF31, CF22, CF22 MS, CF39, or CF39 MS back. It is completely identical to the H2, but this camera was created to "lock out" other digital back providers from the H-series platform. The H2F is compatible with all of the H lenses, including the HCD 24mm, HCD 28mm, and the new HCD 35-90mm zoom lens. "In truth, [the H1] was a great film camera to which a digital back could be fitted, and...Hasselblad started to look at ways that image quality and functionality could be enhanced even more through better integration...The H2 camera has not, in any way, been diminished by Hasselblad's separate development of functions specifically for the integrated H3D. However, lacking the necessary integration of the new camera engine and Hasselblad Flexcolor software, these functions cannot work on the H2." In April 2016, Hasselblad introduced the H6D product line. The current H6D products include H6D-50c and H6D-100c. Preproduction Hasselblad X1D equipped with the 45mm lens. In June 2016, Hasselblad announced the X1D-50c, the first of a new line of medium-format mirrorless cameras. The X1D is comparable in size to current full-frame digital SLRs, but is equipped with a 43.8 x 32.9 mm CMOS sensor. The camera uses a new XCD mount, with two lenses initially available for sale. At the same time, an H-mount adapter was announced, allowing lenses for H systems to be used with full autofocus. The company has since announced that a total of nine XCD lenses will be available by the end of 2018. On 3 February 2014, Hasselblad introduced a restyled Sony α99 as the Hasselblad HV. According to the company's press-release, their version of the α99 is "tough as nails", featuring more robust construction than the original. On 26 November 2014, Hasselblad announced the Stellar II based on the DSC-RX100M2. As of now[when? ], there is no Stellar III or IV based on the already released DSC-RX100M3 and M4. ^ a b c "Public accounts". August 18, 2013. Retrieved August 18, 2013. ^ Savov, Vlad (6 February 2018). "This is how the world's most covetable cameras get made". The Verge. Retrieved 6 February 2018. ^ a b "Hasselblad history - Hasselblad". www.hasselblad.com. Retrieved 2016-04-20. ^ "Storia della Hasselblad". www.photo90.it. ^ "Hasselblad". Shriro Group. Archived from the original on 2007-10-31. Retrieved 2007-10-12. ^ "Hasselblad and Imacon merge". Digital Photography Review. Digital Photography Review. 2004-08-17. Retrieved 2007-10-09. ^ Tzortzis, Andreas (2005-05-30). "Facing a digital world: Famous makers from yesteryear run to catch up". International Herald Tribune. International Herald Tribune. Retrieved 2007-10-07. ^ "Victor Hasselblad AB - GÖTEBORG - Se Nyckeltal, Befattningar med mera". archive.org. 7 November 2013. ^ "Hasselblad set for growth under new European owners". Press Release. Hasselblad. 2011-06-30. Retrieved 2011-06-30. 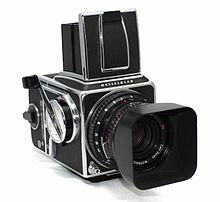 ^ "Hasselblad set for growth under new European owners - Press Releases - Hasselblad". www.hasselblad.com. Retrieved 2016-04-18. ^ James Vincent (January 6, 2017). "DJI reportedly acquires majority stake in historic camera company Hasselblad". The Verge. Vox Media. Retrieved January 9, 2017. The news was first reported by photography site The Luminous Landscape, with TechCrunch confirming the story based on testimonies from "multiple industry insiders." ^ Derr, Albert J (2001-02-01). "Photography Equipment and Techniques: A Survey of NASA Developments" (PDF). Apollo Lunar Surface Journal. NASA SP-5099. Retrieved 2007-10-06. ^ Kitmacher, Gary H (2004-08-03). 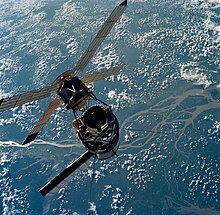 "NASA History Division: Still Photography during Apollo". NASA. Retrieved 2007-10-06. ^ Karlsten, Evald (1981). Hasselblad: dedicated to Victor Hasselblad. Gullers international. p. 91. ISBN 9789185228614. Astronauts Eugene Cernan and Harrison Schmitt left behind on the moon two Hasselblad Data Cameras with Zeiss Biogon lenses ... These cameras joined 10 other Hasselblad's on the moon, left by earlier missions. ^ Heymann, Stefan (2006). "A concise tabulated history of Hasselblad camera models". Hasselblad Historical. Retrieved 2007-10-07. ^ a b "Hasselblad announces 24MP Lunar - an 'ultimate luxury' mirrorless camera". Digital Photography Review. 2012-09-18. Retrieved 2012-09-25. ^ a b Johnson, Allison (2016-06-22). "Medium-format mirrorless: Hasselblad unveils X1D". Digital Photography Review. Retrieved 2016-06-26. ^ a b c Gustavson, Todd (2009). Camera A history of photography from Daguerreotype to Digital. Sterling Signature. ISBN 978-1-4027-5656-6. ^ Hasselblad Price Guide, CollectiBlend. ^ "Hasselblad puts an end to its V line of cameras". British Journal of Photography. Archived from the original on 2013-05-03. Retrieved 2013-05-05. ^ "For a World Less Square - XPan Product Brochure" (PDF). Victor Hasselblad AB. Archived from the original (PDF) on 2007-11-27. Retrieved 2007-10-09. ^ Reichmann, Michael (2002-11-01). "Hasselblad H1 Product Review". photo.net. Archived from the original on 2007-10-12. Retrieved 2007-10-13. ^ "The Evolution of the Hasselblad H System Digital Strategy". Hasselblad News. 2004-08-17. Archived from the original on 2007-09-04. Retrieved 2007-10-09. ^ "Hasselblad announces Wi-Fi enabled H5D-50c camera - Press Releases - Hasselblad". www.hasselblad.com. Retrieved 2016-04-19. ^ "Hasselblad announces groundbreaking medium format options with new H5X system at photokina - Press Releases - Hasselblad". www.hasselblad.com. Retrieved 2016-04-18. ^ "Hasselblad announces Wi-Fi enabled H5D-50c camera - Press Releases - Hasselblad". www.hasselblad.com. Retrieved 2016-04-18. ^ Seifert, Dan. "Hasselblad's new H6D is a return to form and a look toward the future". The Verge. Retrieved 2016-04-20. ^ "Is Hasselblad Planning to Enter the Prosumer Market?". Bokeh by DigitalRev - Focus on photography. Retrieved 2016-04-20. ^ "Hasselblad launches an all new medium format camera - Press Releases - Hasselblad". www.hasselblad.com. Retrieved 2016-04-19. ^ "Hasselblad announces 100MP H6D-100c capable of 4K, H6D-50c 50MP option". dpreview.com. Retrieved 2016-04-19. ^ "Hasselblad expands the XCD lens range to a total of nine lenses in 2018" (Press release). Hasselblad. 2017-11-03. Retrieved 2017-11-12. ^ Michael R. Tomkins, Hasselblad press release quoted in "Hasselblad: Two new film scanners", The Imaging Resource, September 28, 2006. ^ "Hasselblad – Create To Inspire" (PDF). press.hasselblad.com. ^ "Hasselblad – Create To Inspire". press.hasselblad.com. ^ "Hasselblad HV is restyled Sony SLT-A99 with 'tough as nails' construction". dpreview.com. Hasselblad Focal Plane Shutter Models.